While they say one swallow doesn’t make a spring, one swallow genome makes a welcome contribution to the avian genome club. Taking advantage of the latest genomic and optical mapping technologies, a team of Scientists from the University of Milan, California State Polytechnic University and the University of Pavia, have carried out the high quality sequencing of the barn swallow genome, published today in Gigascience. As with the Tegu lizard genome also published this week, this “platinum quality” result represents one of the highest quality animal genome sequences ever produced, with a scaffold N50 of over 25.95 Mbp. The knowledge of the DNA sequence of the barn swallow will boost the conservation efforts for this much loved species, as well and the study of the most fundamental aspects of the biology of this and of many other bird species, including migration, sexual behaviour and adaptation to climate change. While a short read genome of a different subspecies of the barn swallow had already been reported, as the data from that study has not been publicly available the this open and high quality genomic data will be a fantastic resource for researchers of this enigmatic and important species, and also help fill another gap in the high level resolution of the bird family tree that was started with the Avian Phylogenomic Project data we published in 2014. Despite the limited availability of high quality whole genome sequences, previous studies on the barn swallow and other bird species have already demonstrated a strong genetic component to key survival traits such as migration and reproductive behaviour. 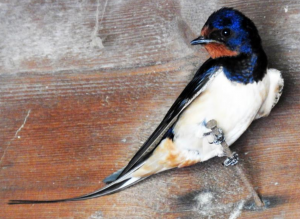 The knowledge of the barn swallow genome sequence will be pivotal to identifying the genes that control key life history characters as well as individual variability. The barn swallow has been intensely studied by scientists but it also has highly iconic cultural value due both to its ‘philopatry’, bringing individuals back to their homes even after a long migration, its demographic decline – partly associated with climate change. The availability of a high quality genome sequence will accelerate researchers’ efforts to understand how environmental changes interact with genetic factors to determine decline in numbers as well as allowing insights into the adaptive processes that could assist in the adaptation of populations to rapidly changing environmental conditions. The physiology, morphology and behaviour of an organism depends on environmental conditioning and genetic material. The study of genetic control of the phenotype is greatly facilitated by detailed knowledge of the genome sequence. Our ability to ‘assemble’ genomes, has been rapidly improving in this era of long read sequencing. On top of the addition of long read PacBio data, the quality of this genome has also been further enhanced with improvements to optical mapping technologies. While we published early examples of bionano-improved genome assembly in 2014, new non-nicking chemistry (DLE-1) was launched earlier in the year and through doubling the N50 scaffold sizes the study showcases the utility of optical mapping technology. When we launched our Optical Mapping series in 2014 it was a new and niche technique, but you can see with this new work that it is rapidly becoming part of the standard genome assembly toolkit. 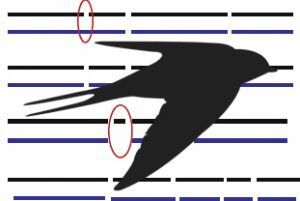 The high quality assembly of the barn swallow genome means it forms a useful contribution to the global Vertebrate Genomes Project (http://www.vertebrategenomesproject.org), coordinated in Italy by the authors Giulio Formenti and Nicola Saino. Coming from our friends at the Genome10K consortium, the VGP is working to generate near error-free reference genome assemblies of all 66,000 extant vertebrate species. With this data actually exceeding their “Platinum Genome” criteria, which requires a contig N50 in excess of 1 Mb and scaffold N50 above 10 Mb. Attending the G10K and VGP meeting in New York in September, we were witness to its first release of its first 15 reference genomes in their new GenomeArk platform. With similar open data aims in mind, the optical maps and annotations and other data and results from this paper are available in the GigaScience GigaDB respository, where it joints the large (over 50) and growing number of bird genomes we have collected for the Avian Phylogenomic and follow on B10K projects.